Zion is pretty much the perfect National Park. It offers jaw-dropping scenery, enough hikes to keep you busy for days, and it’s just a short, 3-hour drive from the man-made wonder of Las Vegas. Most people end up visiting in the summer, but I’m going to recommend — no, insist — that you check it out during winter. Zion reports that in July, 2016, more than 601,000 people visited the park. That’s more than the population of Wyoming, and a heck of a lot of people. But, compare that number to January, when just about 86,000 visited. That’s seven times more people in July than January. And while January was the month with the fewest visitors, February and December also had plenty of elbow room (about 120,000 visitors each). The crowds pick up in March, but are still just a bit more than half of the July peak. 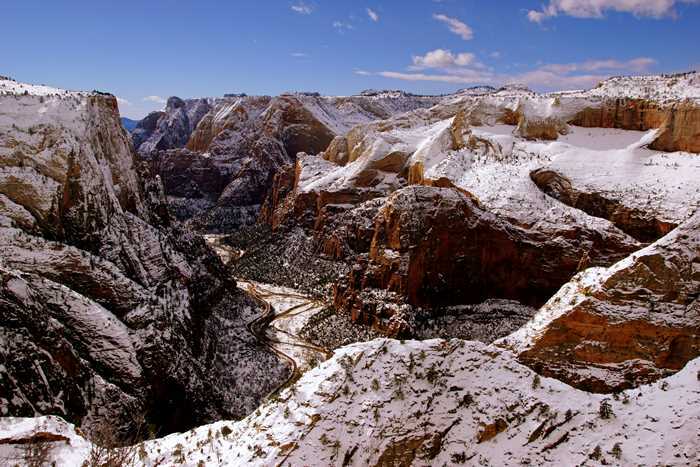 Making my way to the end of Angels Landing, just two days after a snowstorm, was a great accomplishment for me. I didn’t think I could be any happier — until I saw that someone before me had built a snowman. And he wasn’t the only one. I also discovered a snowman at the end of the Riverside Walk trail, as well as a few smaller ones in various places around the park. I suppose you’ll be able to see some great sunsets any time of the year in Zion National Park, but I think there’s something special about the clouds and colors during winter. I caught several sunsets at the bridge near Canyon Junction (perhaps the most popular photo spot in the park), and one sunset at Canyon Overlook. Even when the canyon itself is grey, the clouds are often more broken once you get past Springdale. Partly-cloudy conditions allow light to stream in, casting unpredictable beams of light on the Watchman and other peaks that surround the Virgin River near the park entrance. 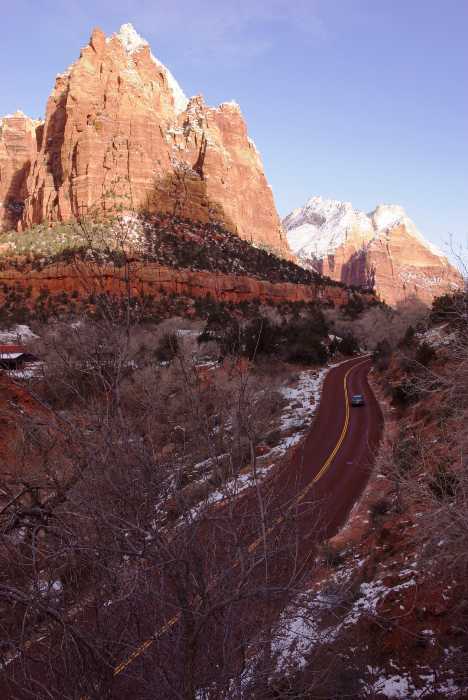 That big, pointy mountain that looms over Springdale is an iconic figure of Zion, and you’ll see it from dozens of different angles around town and in the park. 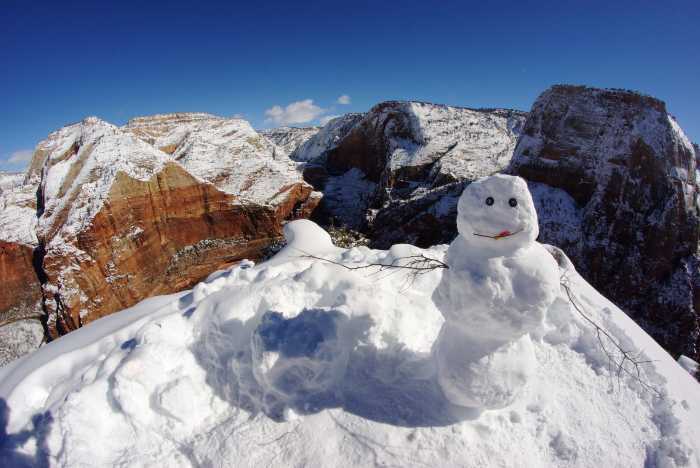 But, the Watchman looks different after a snowfall. Every crack and crevice is outlined by a streak of white powder, making the mountain look entirely different during the winter. Speaking of mountains that look different when covered with snow, it’s worth the effort to drive out to the east end of the park to see Checkerboard Mesa. 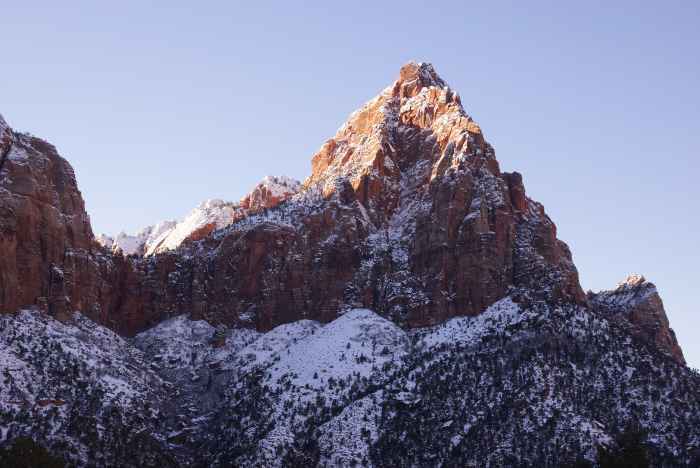 This unusually-patterned mountain welcomes Zion visitors as they arrive from the east, and most of the time it looks a lot like a checkerboard, with criss-crossed lines that form squares or diamonds. But, add a dusting of snow, and those lines become much more interesting. Add even more snow, and they start to disappear — as was happening on the days that I drove out to the east end of the park. If it’s snowing in the canyon, you should prepare for even more serious winter conditions on the east side. Don’t drive it unless you know what you’re doing. 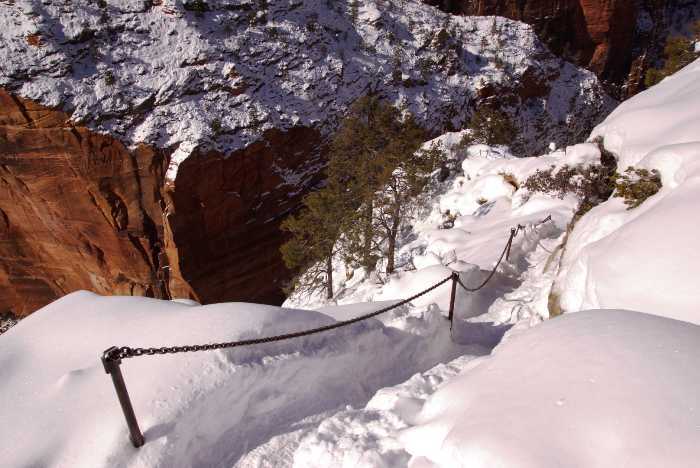 Getting up Angels Landing is challenging, even on a snow-free summer day, but when you dump a foot of snow on the narrow ledges of this trail, things get tricky. On my first hike (which took place in the middle of a snowstorm) I quickly realized the final half-mile out to the end was too treacherous. I returned later in the week, when conditions were just slightly better. Getting out to the end was challenging, but the return trip was the real adventure. Most of the route was downhill, and for most of the way, I was on my rear, sliding instead of walking. At times, the trampled footpath was similar to a bobsled track — with one critical difference: instead of rounding a curve, you’d simply slide off the ledge and plunge 1,500 feet to the canyon floor. The chains help, but they also hurt. Days after returning home, I was still covered with bruises on my arms and legs, from trying to grab onto those chains and poles, in any manner possible. Here’s what it looks like in the summer. Zion’s shuttle buses are a necessary inconvenience. It would be impossible for the canyon to handle the massive number of visitors during the summer months if everyone drove their own car. The system runs well, and is as good as it could be, but it’s still inconvenient to lose the flexibility of going where you want, and stopping where you want, when you want. This is one of the biggest benefits of visiting during the winter months — shuttle bus service is suspended until mid-March. This means you can drive your own car up the scenic road and stop at every turnout, if you wish. You also don’t have to struggle to find a parking spot near the visitor center (where you catch the shuttle). There’s a good chance that you’ll run into wildlife along the trails in Zion, on any day of the year. 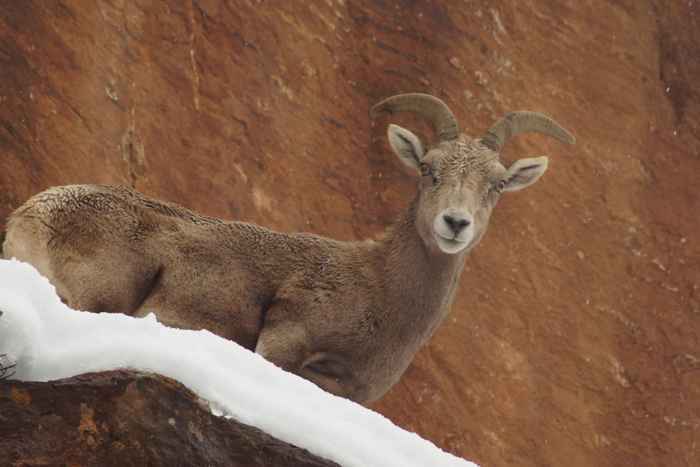 Bighorn Sheep and deer are common sights, and they’re pretty laid-back around humans. But in winter, you’ll see them everywhere, quietly munching on whatever vegetation they can find. A couple of times, sheep ended up in front of me on the trail, leading to some persuasive conversations and negotiating tactics in order to pass. There’s nothing more relaxing than the sound of absolutely nothing, as you walk through a downpour of snow. All those falling flakes absorb the sounds around you, creating an unparalleled tranquility. 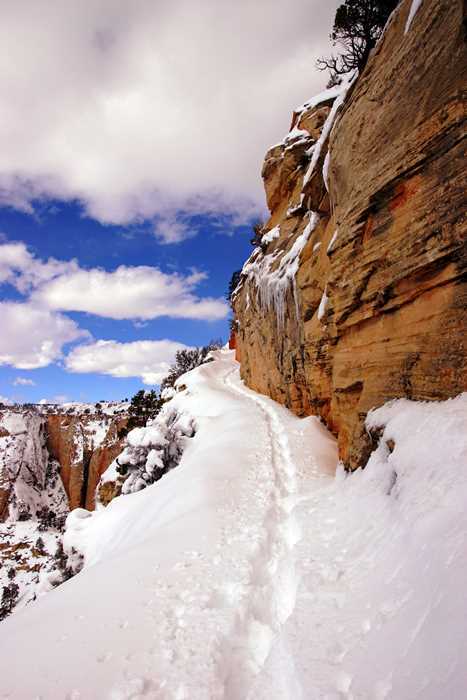 If you’re fortunate enough to end up in Zion during a big snowstorm, don’t worry about hiking the big trails. 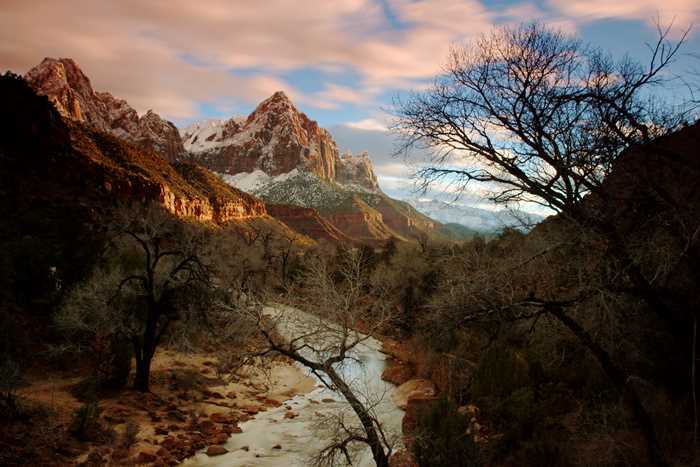 Just go for a walk along the banks of the Virgin River, or on some of the easier paths. 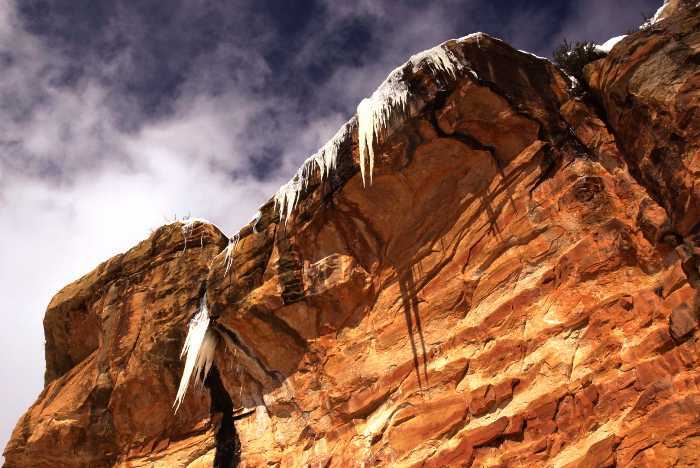 Cold weather combines with trickling water to create some amazing natural ice sculptures in Zion National Park during the winter months. You’ll find some very impressive icicles in many different spots around the park, but I was most pleased with the ones I saw along the trail to Observation Point. 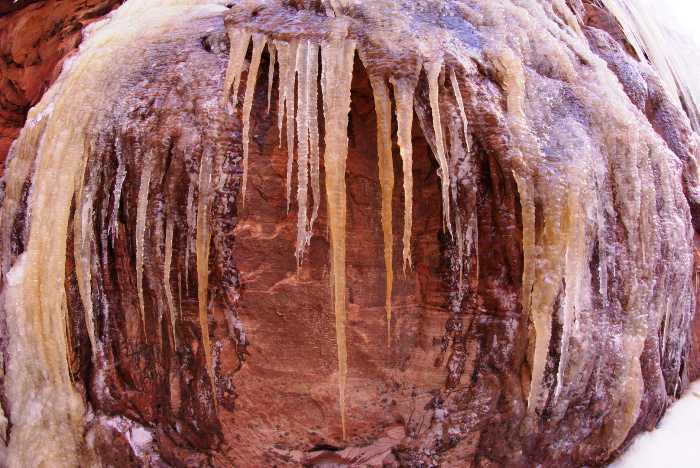 Even if you don’t go all the way to the end of the trail (which can be difficult or impossible after a snowstorm), you’ll see some immense icicles on the far side of Echo Canyon, about a mile and a half from the trailhead. A day or two after that peaceful, relaxing snowfall, that snow gets pretty noisy. The sun comes out, and it all starts to melt, and slide. 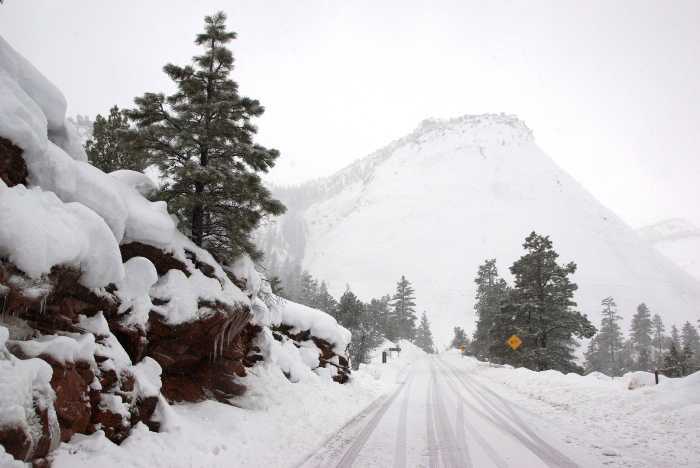 As you’re enjoying the silence along a trail, you’ll suddenly hear a rumble from across the canyon, as a mini-avalanche sends snow and ice tumbling. There’s a small element of danger here — we all learned that icicles can kill people from Ralphie’s mom. But for the most part, you’ll just hear the rumbles from a safe distance. I know that “too cold” is subjective, and some people won’t be able to tolerate Zion in winter. But with the proper clothing, you can stay toasty while hiking, even in a snowstorm. During my visit in late January, I had a couple of days of snow, a couple of cloudy days, and a couple of clear blue days. Those sunny days started out cold, with temperatures below 20 degrees Fahrenheit (about -7 Celsius). But, they warmed up into the 30’s and 40’s. On the snowy days, temperatures hovered around freezing. 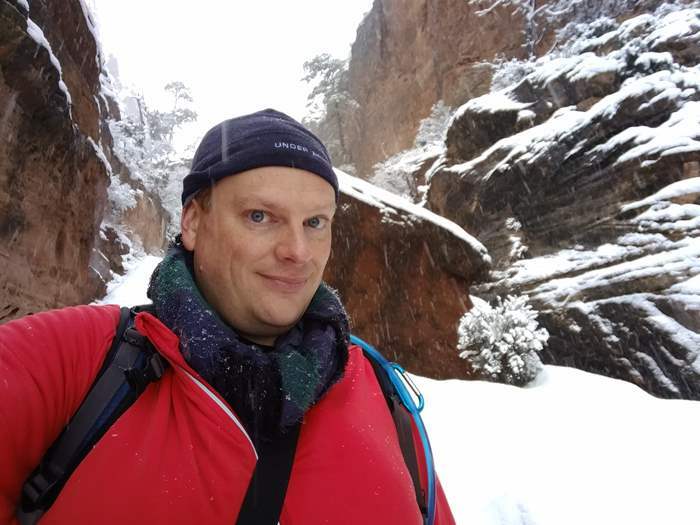 It was common to have snow falling on the trails and at the upper end of the canyon, while rain or sleet fell in Springdale. You’ll want to pack the right clothing for cold weather. I wore hiking boots with wool socks, thermal underwear under my jeans, and a thermal shirt, hoodie, and jacket. Adding a scarf and a good cap made a big difference. 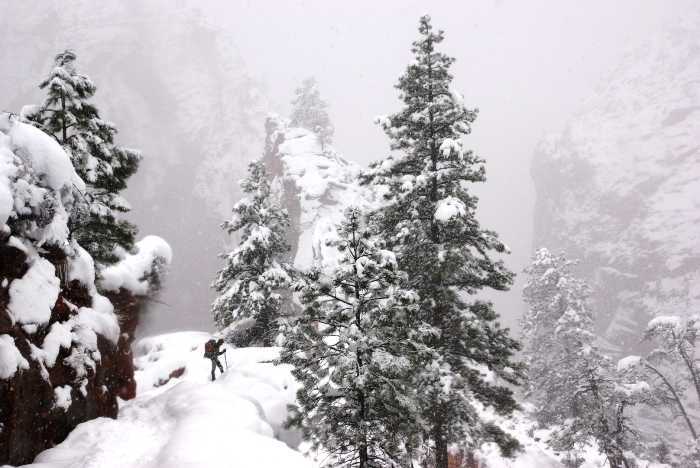 Gloves helped on rare occasions, like when holding the chains on the way up to Angels Landing. I was pretty comfortable the entire time. 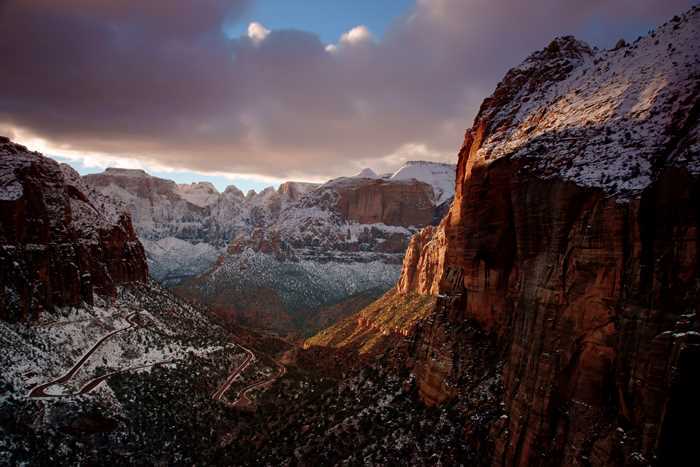 With relatively few people visiting Zion in winter, I felt pretty comfortable leaving some cameras in scenic spots, and shooting time-lapse videos of clouds racing over The Patriarchs or Angels Landing. Sometimes I’d mount a camera to a tree branch, other times I’d set a tripod in the snow and simply walk away, returning at the end of the day to gather the equipment. None of the cameras were stolen, and none of the videos captured any curious onlookers. In most places, I could tell by the tracks in the snow that no one had even gotten close to the cameras, all day long. When you’re hiking on snow-covered trails, the journey is twice as difficult, and at least twice as rewarding. But that snow will make some trails impassable — or make them shorter. On my hike up to Observation Point, the first mile or two was nicely packed and relatively easy to hike. But as I went further, the snow got deeper, and that easy trail turned into a series of holes left by just a few sets of feet. I had to choose whether to make my own tracks or follow the existing ones. Either way, I risked sinking into crotch-deep snow with each step. I almost made it to the top of the plateau, but I was still at least a half-mile from Observation Point. The other hikers on the trail (surprisingly, there were a few) reported that the trail essentially ended up ahead, and snow shoes would be required to finish the hike. So, I picked a nice spot with a good view, and resolved that almost there was good enough. The sun rises late and sets early in the winter months, and that’s usually a disadvantage for anyone who wants to cram maximum enjoyment into their day. But the truth is, you can thoroughly wear yourself out in the 11 hours of daylight that you get during winter. And once the sun goes down, you’re pretty much forced back to the hotel to relax and grab some dinner. The end result is a more relaxing vacation. It’s a real pain to stay at a hotel outside of Springdale. The daily commute from St. George or Hurricane is painfully slow, with constantly-changing speed limits and frustrating traffic. In the summer, if you want a reasonable hotel rate, you’d better plan on a 45-minute commute, each way. Hotel rooms in Springdale will skyrocket to $300 or more per night during the warmer months. But in winter, everything is different. I stayed at Cliffrose Lodge and Gardens — close enough to walk into the park — for around $80 dollars a night. Are you convinced? I know I’ll be going back. Zion is my favorite park — I’ve been there several times, and I never run out of things to do. It’s my retreat from the crazy, hectic, frustrating world. And while it will be there, any time of year, whenever I need it, the wonder of winter won’t. Be brave, take those vacation days early in the year, and brush up on your snow-driving skills. Zion in the winter is worth it. I’ll be writing more about my visit to Zion in the weeks to come. Stay tuned for more pictures and greater details on each hike and attraction I experienced. 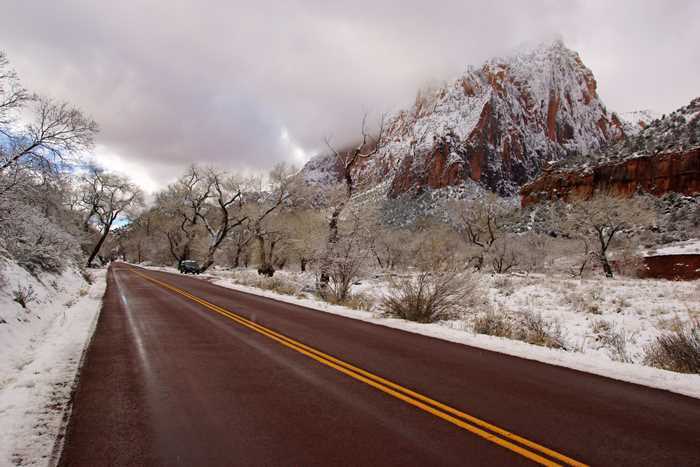 In the meantime, you can check out the Southwest Utah Trip for some warmer-weather guidance.